VT-d stands for Intel Virtual Technology for Directed IO, and provides hardware capabilities to assign I/O devices to VMs and extending the protection and isolation properties of VMs for I/O operations. DMA remapping: for supporting address translations for DMA from devices. Interrupt remapping: for supporting isolation and routing of interrupts from devices and external interrupt controllers to appropriate VMs. Interrupt posting: for supporting direct delivery of virtual interrupts from devices and external controllers to virtual processors. ACRN hypervisor supports DMA remapping that provides address translation capability for PCI pass-through devices, and second-level translation, which applies to requests-without-PASID. ACRN does not support First-level / nested translation. For specific platforms, ACRN hypervisor uses pre-parsed DMA remapping reporting information directly to save time for hypervisor boot-up. Generally, there is a dedicated remapping hardware unit for the Intel integrated graphics device. ACRN implements GVT-g for graphics, but GVT-g is not compatible with VT-d. The remapping hardware unit for graphics device is disabled on ACRN if GVT-g is enabled. If the graphics device needs to pass-through to a VM, then the remapping hardware unit must be enabled. DMA remapping hardware is used to isolate device access to memory, enabling each device in the system to be assigned to a specific domain through a distinct set of paging structures. A domain is abstractly defined as an isolated environment in the platform, to which a subset of the host physical memory is allocated. The memory resource of a domain is specified by the address translation tables. 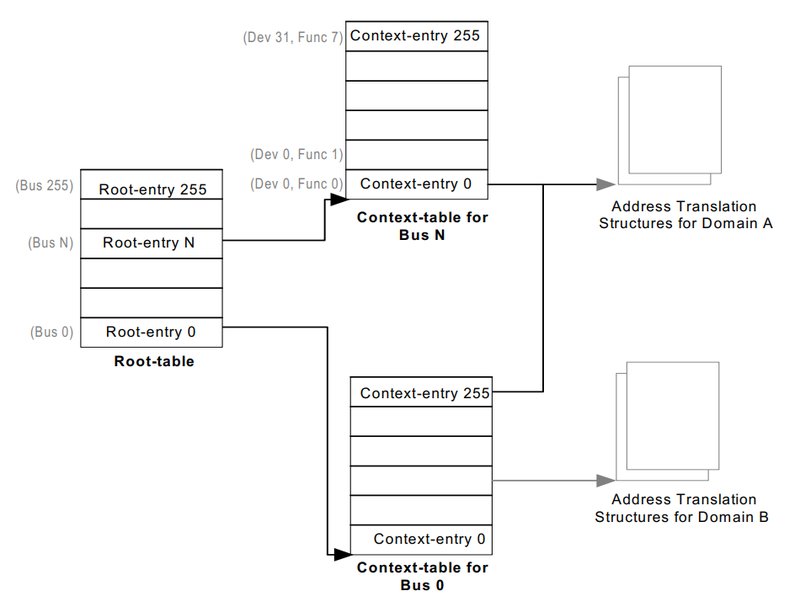 VT-d hardware uses root-table and context-tables to build the mapping between devices and domains as shown in Figure 98. The root-table is 4-KByte in size and contains 256 root-entries to cover the PCI bus number space (0-255). Each root-entry contains a context-table pointer to reference the context-table for devices on the bus identified by the root-entry, if the present flag of the root-entry is set. Each context-table contains 256 entries, with each entry corresponding to a PCI device function on the bus. For a PCI device, the device and function numbers (8-bits) are used to index into the context-table. Each context-entry contains a Second-level Page-table Pointer, which provides the host physical address of the address translation structure in system memory to be used for remapping requests-without-PASID processed through the context-entry. For a given Bus, Device, and Function combination as shown in Figure 99, a pass-through device can be associated with address translation structures for a domain. Refer to the VT-d spec for the more details of Device to domain mapping structures. On ACRN, EPT table of a domain is used as the address translation structures for the devices assigned to the domain, as shown Figure 100. 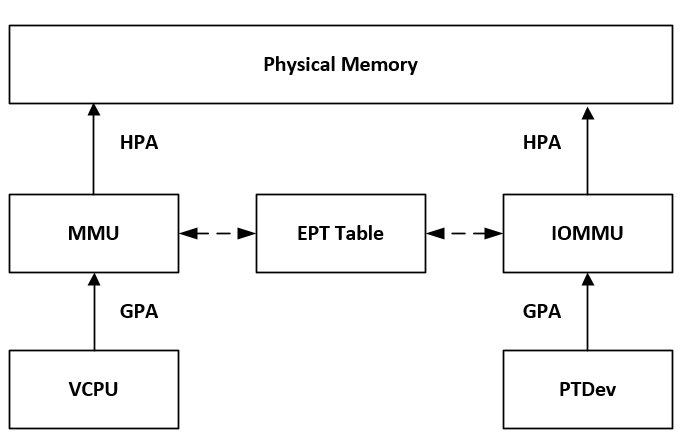 When the device attempts to access system memory, the DMA remapping hardware intercepts the access, utilizes the EPT table of the domain to determine whether the access is allowed, and translates the DMA address according to the EPT table from guest physical address (GPA) to host physical address (HPA). There are no DMA operations inside the hypervisor, so ACRN doesn’t create a domain for the hypervisor. No DMA operations from pass-through devices can access the hypervisor memory. ACRN treats each virtual machine (VM) as a separate domain. For a VM, there is a EPT table for Normal world, and there may be a EPT table for Secure World. Secure world can access Normal World’s memory, but Normal world cannot access Secure World’s memory. SOS_VM domain is created when the hypervisor creates VM for the Service OS. IOMMU uses the EPT table of Normal world of SOS_VM as the address translation structures for the devices in SOS_VM domain. The Normal world’s EPT table of SOS_VM doesn’t include the memory resource of the hypervisor and Secure worlds if any. So the devices in SOS_VM domain can’t access the memory belong to hypervisor or secure worlds. Other VM domains will be created when hypervisor creates User OS. One domain for each User OS. IOMMU uses the EPT table of Normal world of a VM as the address translation structures for the devices in the domain. The Normal world’s EPT table of the VM only allows devices to access the memory allocated for Normal world of the VM. EPT table of a VM. ACRN will flush the related cache line after updates of these structures if the VT-d hardware doesn’t support page-walk coherency. ACRN VT-d reuses the EPT table as address a translation table. VT-d capability for super-page support should be identical with the usage of EPT table. If VT-d hardware supports snoop control, it allows VT-d to control to ignore the “no-snoop attribute” in PCI-E transactions. ACRN enable Snoop Control by default if all enabled VT-d DMAR units support Snoop Control by setting bit 11 of leaf PTE of EPT table. Bit 11 of leaf PTE of EPT is ignored by MMU. So no side effect for MMU. If one of the enabled VT-d DMAR units doesn’t support Snoop Control, then Bit 11 of leaf PET of EPT is not set since the field is treated as reserved(0) by VT-d hardware implementations not supporting Snoop Control. During hypervisor initialization, it registers DMAR units on the platform according to the reparsed information or DMAR table. There may be multiple DMAR units on the platform, ACRN allows some of the DMAR units to be ignored. If some DMAR unit(s) are marked as ignored, they would not be enabled. Hypervisor creates SOS_VM domain using the Normal World’s EPT table of SOS_VM as address translation table when creating SOS_VM as Service OS. And all PCI devices on the platform are added to SOS_VM domain. Then enable DMAR translation for DMAR unit(s) if they are not marked as ignored. All devices are initially added to SOS_VM domain. To assign a device means to assign the device to an User OS. The device is remove from SOS_VM domain and added to the VM domain related to the User OS, which changes the address translation table from EPT of SOS_VM to EPT of User OS for the device. To unassign a device means to unassign the device from an User OS. The device is remove from the VM domain related to the User OS, then added back to SOS_VM domain, which changes the address translation table from EPT of User OS to EPT of SOS_VM for the device. During platform S3 suspend and resume, the VT-d register values will be lost. ACRN VT-d provide APIs to be called during S3 suspend and resume. During S3 suspend, some register values are saved in the memory, and DMAR translation is disabled. During S3 resume, the register values saved are restored. Root table address register is set. DMAR translation is enabled. All the operations for S3 suspend and resume are performed on all DMAR units on the platform, except for the DMAR units marked ignored. ACRN VT-d supports DMA remapping error reporting. ACRN VT-d requests a IRQ / vector for DMAR error reporting. A DMAR fault handler is registered for the IRQ. DMAR unit supports report fault event via MSI. When a fault event occurs, a MSI is generated, so that the DMAR fault handler will be called to report error event. Register DMAR units on the platform according to the pre-parsed information or DMAR table. IOMMU is a must have feature, if init_iommu failed, the system should not continue booting. Create a iommu domain for a VM specified by vm_id. Create a iommu domain for a VM specified by vm_id, along with address translation table and address width. Destroy the specific iommu domain. Destroy the specific iommu domain when a VM no longer needs it. Suspend all IOMMUs, which are not ignored on the platform. Resume all IOMMUs, which are not ignored on the platform. Assign a device specified by bus & devfun to a iommu domain. Remove the device from the from_domain (if non-NULL), and add it to the to_domain (if non-NULL). API silently fails to add/remove devices to/from domains that are under “Ignored” DMAR units.